The 26th of January was chosen to honour the memory of the declaration of independence of 1930. It is one of the three national holidays in India. While the main parade takes place in the national capital New Delhi at the Rajpath before the president, the anniversary is also celebrated with varying degrees of formality in state capitals and other centres. A grand parade is held in New Delhi and the event starts with India's prime minister laying a wreath at the Amar Jawan Jyoti at India Gate, to remember soldiers who sacrificed their lives for their country. India's president takes the military salute during the parade in New Delhi while state governors take the military salutes in state capitals. A foreign head of state is the president's chief guest on Republic Day. Awards and medals of bravery are given to the people from the armed forces and also to civilians. Helicopters from the armed forces then fly past the parade area showering rose petals on the audience. School children also participate in the parade by dancing and singing patriotic songs. Armed Forces personnel also showcase motorcycle rides. The parade concludes with a "fly past" by the Indian Air Force, which involves fighter planes of flying past the dais, symbolically saluting the president. These leave trails of smoke in the colors of the Indian flag. There are many national and local cultural programs focusing on the history and culture of India. Children have a special place in these programs. Many children receive gifts of sweets or small toys. A prime minister's rally also takes place around this time of the year, as well as the Lok Tarang – National Folk Dance Festival, which occurs annually from January 24-29.
opposite INA Market and Shri Gandhi Ashram ChandniChowk. Tickets at these counters will be available only on working days. Tickets will also be available at nine Departmental Sale Counters on all days between 1000 - 1730 hrs (without lunch break). and Parliament House (Reception Office). The tickets at Parliament House Reception will be available from January 19 to January 28, 2012 from 1100 hrs to 1600 hrs. 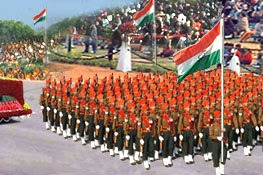 For more details on Republic Day 2012,contact Shri S Arora, Officer on Special Duty (Sale of Tickets & Printing), Room No. B-26, near Gate No. 9, South Block, New Delhi - 110011, Telephone No. 2301 5701. How can you celebrate Republic Day? Republic Day is a gazetted holiday in India on January 26 each year. National, state and local government offices, post offices and banks are closed on this date. Stores and other businesses and organizations may be closed or have reduced opening hours.We all know that its a declared holiday for us.But these are several ways on how you can celebrate Republic Day. 1)The simplest and the most common,get a tattoo done with indian flag colours.On republic day,most of the malls or tourist spots have provisions for face tattoo with indian flag poster colours,get it done. 2)Catch the live spectacle that the nation is witnessing on jan 26,Republic Day Parade at Rajpath instead of watching it on TV.The celebrations and the parade is grand,hurry book your tickets. 3)If you are working somewhere, you can do is keep small Indian flag on all Employees Desks.As 26th is holiday,the best way to do is place it on 25th night,and let the employees wake up on 27th with a pleasant patriotic surprise. 4)Write your own poems ,articles ,blog for your country and send it to Times of India/HT/any newspaper.They have an entire section contributed by readers on republic day. 5)Together with a group of friends,head onto the highest hilltop in your city,and the national flag in a group. 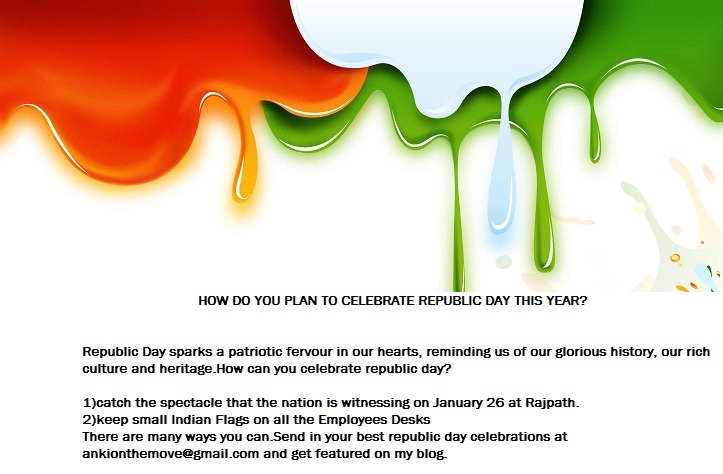 7)Easiest is,forward a simple happy republic day sms to your friend,or post on your wall the indian flag badge. 8)Decorate your shop/home/hostel/college with tricolour balloons.